Friendship pledge found in Scott County. Charles Bertram, H-L. 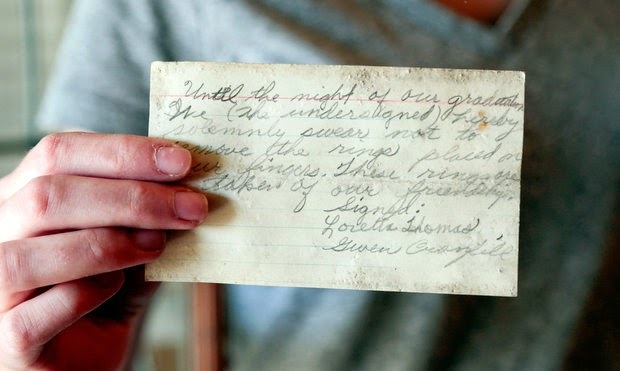 Earlier this week, the Lexington Herald-Leader's weekly unCommonwealth series, written by Cheryl Truman, told the story of a decades old correspondence uncovered in a Georgetown home. You can read that story here. Until the night of our graduation, we, the undersigned, hereby solemnly swear not to remove the rings placed on our finger. These rings are a token of our friendship. The friendship pledge was interesting, in part, because of the observation that "what happened to Loretta Thomas is unknown." The Herald-Leader story said that Gwen Cranfill became a professor and chair of English at Georgetown College; in 2013, she died at the age of 77. With a few minutes on ancestry.com, I didn't have the answers to the fate of Loretta Thomas ... but I did have something. By backing out Gwen's age from the year in which she passed away, I guessed that she was born around 1935. On a hunch, I guessed her friend Loretta was approximately the same age. Within seconds, I was looking at the 1949 yearbook from the "Green & White" which was the yearbook for Garth High School. The two girls were freshmen. And though in different rows, they appear next to one another in the class photo. Above, is the full page of the yearbook as extracted from ancestry.com. 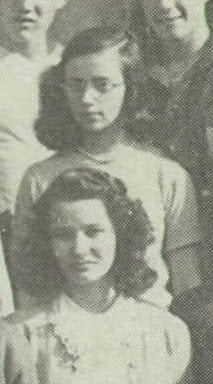 And to the right is close up of the two girls with Loretta Thomas standing immediately in front of her best friend, Gwen Cranfill. There still lingers that question, though, of what ever became of Miss Loretta Thomas? The girls' school, Garth High School, remains standing on South Hamilton Street in Georgetown, Kentucky. The school " is a 250-by-110 foot symmetrical irregularly shaped red brick building of the Collegiate Gothic and Arts and Crafts styles ... decoratively detailed with stone," according to the National Register file on the structure. Garth School was built in 1925 and added to the National Register in 1971. Today, the building continues to serve an educational purpose as the Garth Elementary School. Garth School, Georgetown, Kentucky. Russell & Sydney Poore. Ancestry.com. 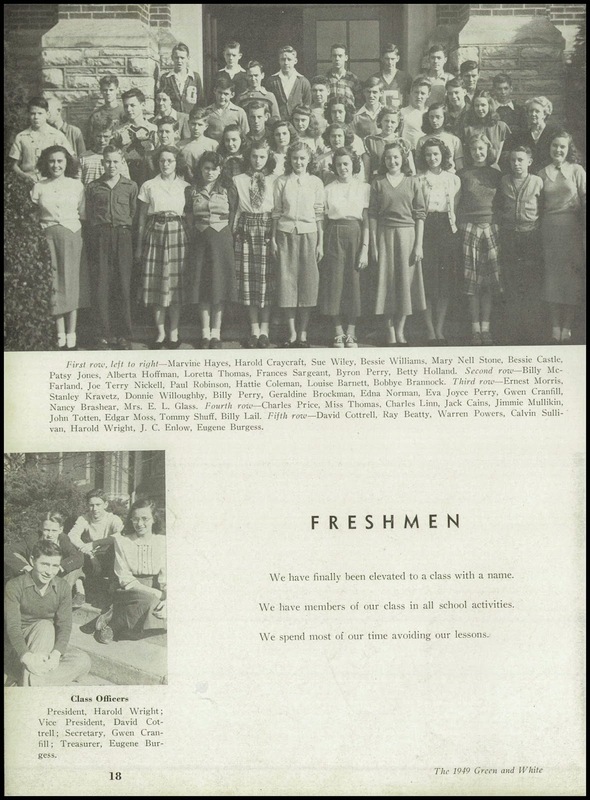 U.S. School Yearbooks, 1880-2012 [database on-line]. Provo, UT, USA: Ancestry.com Operations, Inc., 2010. National Register of Historic Places, Garth School, Georgetown, Scott County, Kentucky, National Register #88002187.